FRESNO, Calif. (KFSN) -- The community, Fresno State and the sports world are mourning the loss of Coach Jerry Tarkanian. He couldn't stop fighting the NCAA any more than he could give up chewing towels courtside. Jerry Tarkanian built a basketball dynasty in the desert, but it was his decades-long battle with the NCAA that defined him far more than the wins and losses. The coach who won a national title at UNLV and made the school synonymous with basketball died Wednesday after several years of health issues. He was 84. Tarkanian battled an infection since he was hospitalized Monday in Las Vegas with breathing difficulty, said his son Danny Tarkanian, a point guard on his father's teams in the 1980s. "He fought and fought and fought," Danny Tarkanian told The Associated Press. Tarkanian put the run in the Runnin' Rebels, taking them to four Final Fours and winning a national championship in 1990 with one of the most dominant college teams ever. His teams were as flamboyant as the city, with light shows and fireworks for pregame introductions and celebrities jockeying for position on the so-called Gucci Row courtside. He ended up beating the NCAA, too, collecting a $2.5 million settlement after suing the organization for trying to run him out of college basketball. He also won over many of his critics. But he was bitter to the end about the way the NCAA treated him while coaching. The night before he died, fans attending UNLV's game against Fresno State draped towels over the statue of Tarkanian outside the campus arena. Tarkanian is depicted in the statue chewing on a towel while sitting in a courtside chair urging his team on. Senate Minority Leader Harry Reid, a longtime family friend, said Tarkanian's legacy was far more widespread than just in Las Vegas, where he made UNLV a national power and was a bigger star than anyone playing on the Las Vegas Strip. "Jerry's mark on American athletics is significant not only because of his coaching ability, but also his fearlessness in taking on the brutal NCAA," Reid said. "They controlled, bullied and tried to embarrass him, but he never stopped fighting until they cried uncle." Tarkanian's wife, Lois, said her husband fought health problems for the last six years with the same "courage and tenacity" he showed throughout his life. His death came just days after the death of another Hall of Fame coach, North Carolina's Dean Smith. "Our hearts are broken but filled with incredible memories," Lois Tarkanian said in a family statement. "You will be missed Tark." Tarkanian's career spanned 31 years with three Division I schools, beginning at Long Beach State and ending at Fresno State, where Tarkanian himself played in 1954 and 1955. Only twice did his teams fail to win at least 20 games in a season. But it was at UNLV where his reputation was made, both as a coach of teams that often scored in the triple digits and as an outlaw not afraid to stand up to the powerful NCAA. He went 509-105 in 19 seasons with the Runnin' Rebels before finally being forced out by the university after a picture was published in the Las Vegas Review-Journal showing some of his players in a hot tub with a convicted game fixer. UNLV was already on probation at the time, just two years after winning the national title and a year after the Runnin' Rebels went undefeated into the Final Four before being upset in the semifinals by the same Duke team they beat by 30 points for the championship the year before. Even after losing four of his starters off that team and being on probation, Tarkanian went 26-2 in his final year at UNLV. His overall record is listed several different ways because the NCAA took away wins from some of his teams, but the family preferred to go with his on court record of 784-202. Tarkanian's style evolved as he was able to recruit better players, and the Rebels were all about running and shooting. But the core of his high flying offenses was great defense, and Tarkanian drilled them constantly in practice to commit to nonstop pressure and create turnovers. "Everything had to be full speed intense," he once said. "A lot of coaches want guys to be loose for games. I never wanted them to be loose. I wanted their hands sweating, their knees shaking, their eyes bulging. I wanted them to act like we were going to war." He was hired at Long Beach State in 1968 and went 23-3 in his first year, then led the school to four straight NCAA tournament appearances, including the 1971 West Regional final, where Long Beach led UCLA by 12 points at halftime only to lose by two. While at Long Beach he got into his first dispute with the NCAA, writing a newspaper column that questioned why the organization investigated Western Kentucky and not a powerful university like Kentucky. By the time he moved to Las Vegas in 1973, Tarkanian was considered one of the rising coaching stars in the country. He quickly built a name for what was then a small school and by his fourth season at UNLV he had the Runnin' Rebels in the Final Four, where they lost 84-83 to North Carolina. It would be another decade before UNLV made the Final Four again, and the Runnin' Rebels were in three in five years, including the national championship season of 1990. After being forced out at UNLV, Tarkanian briefly coached in the NBA, going 9-11 with the San Antonio Spurs before being fired in a dispute with ownership. Five years after leading UNLV to an NCAA title, Jerry Tarkanian returned to his alma mater. Tark rode a wave of public support and took the Fresno State job in April of 1995. "If there was any way that I could end my coaching career, this would be the best place," said Jerry Tarkanian. After Tark's return, electricity returned to the Bulldog program. This was a team to be reckoned with nationally, but off-the-court troubles dogged Tark's team. "We had to lead the nation in suspensions. I never saw anything like it. The coaching was very difficult but the people here were wonderful," Tark said in February of 2005. Never shy about challenging the NCAA, Tarkanian once famously said: "The NCAA is so mad at Kentucky, it's going to give Cleveland State two more years' probation." Point-shaving allegations in 1997 ultimately went unproven. But, controversy followed Jerry Tarkanian wherever he went -- but so did that towel -- as well as future NBA players. Courtney Alexander, Chris Herren, Melvin Ely and Rafer Alston all came aboard at Fresno State. The dogs reached the NIT semi-finals in New York in 1998, but some players' off-court problems -- including arrests and substance abuse issues -- went national in a 60-Minutes story. Tark said he invited Mike Wallace to Madison Square Garden to scold him. 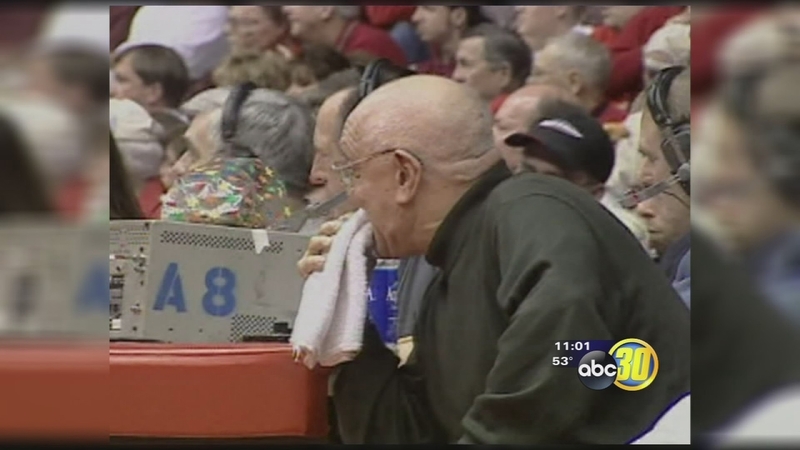 Two years later Tark cried tears of joy as Fresno State finally reached the NCAA Tournament. He enjoyed six straight 20-win seasons with the Bulldogs before he retired March 15th, 2002. "This was like a dream for me to end my career here." Coach loved a good fight. Tark won a $2.5 million settlement with the NCAA in a harassment case. He also won over many of his critics. Jerry Tarkanian finished with 784 division-one victories, and in September of 2013, he was voted into the Naismith Basketball Hall of Fame, an honor his fellow coaches argued for years was long overdue. Though hospitalized in the summer for heart problems and weakened by a variety of ills, he went on stage with a walker at the induction ceremony. A long speech wasn't needed because his smile said it all. Tarkanian was a fixture at UNLV games in his later years, watching from a sideline seat next to the court that was named after him. Tarkanian is survived by his wife and four children. The ESPN and Associated Press contributed to this story. Hall of Fame basketball coach Jerry Tarkanian passed away this morning at Valley Hospital, surrounded by those he loved most: family, friends, and former players. His wife, Lois, stated, "Jerry has been in fragile health since 2009. He fought his health problems with the same courage and tenacity he showed throughout his life. Our family thanks, from the bottom of our hearts, all those who have sent letters and prayers, who have shown their love for Jerry and support for our family, the numerous fans, and the many players who considered him a second father. "Our hearts are broken but filled with incredible memories. You will be missed Tark." FRESNO, Calif. - Jerry Tarkanian - a Naismith Hall of Famer and Fresno State legend having both played and coached for the Bulldogs - passed away Wednesday morning at a Las Vegas-area hospital with his family by his side. He was 84. He is survived by his wife, Lois, also a Fresno State graduate, four children and seven grandchildren. Tarkanian, who was inducted into the Naismith Memorial Basketball Hall of Fame in September 2013, played at Fresno State from 1954-55 and later coached for the Bulldogs from 1995-02. "Jerry Tarkanian is one of the true legends in the coaching profession," current Fresno State head men's basketball coach Rodney Terry said. "He was successful at so many different levels in college basketball. Coach Tarkanian welcomed me in from the first day I arrived in Fresno. He loved the Bulldogs and stayed connected with our program throughout the years. Our thoughts and prayers are with his wife Lois and family during this extremely difficult time." Tarkanian's jersey was retired at Fresno State on March 1, 2014 at the Save Mart Center during a game played in front of a crowd of 14,801, the fourth-largest in the history of the arena. "Jerry Tarkanian was a great coach, mentor and citizen in the Central Valley. Mary and I enjoyed visiting with him at Bulldog games, including when his jersey was retired at the Save Mart Center last year," Fresno State President Joseph I. Castro said. "We at Fresno State send our deepest condolences to Lois and the entire family. His many positive contributions to Fresno State are deeply appreciated by his colleagues and friends in our community." The 'Dogs advanced to the postseason in each of his seven coaching seasons. With a 104-79 overall record, Tarkanian ranks third all-time for most wins by a Fresno State head men's basketball coach behind Boyd Grant (194) and Ed Gregory (172). In over 30 years coaching, he led teams to four appearances in the NCAA Final Four (UNLV in 1977, 1987, 1990 and 1991), one national championship (UNLV in 1989-90) and owned a 38-18 record in 18 NCAA tournament appearances. Tarkanian led Fresno State to consecutive NCAA Tournament appearances in 2000 and '01, a 2001 WAC title and a 2002 WAC Tournament championship. In 2001, the Bulldogs reached the second round of the NCAA's before falling to defending champion Michigan State. Holds a career winning percentage of .803, fourth best all-time. Became the eighth coach to reach the 750-victory mark at the major college level, defeating UTEP 108-56 on Jan. 25, 2001. Led Fresno State to six consecutive 20-win seasons and seven postseason appearances, the first time that feat has been accomplished in Bulldog basketball history. Tutored 42 players who were drafted by the NBA, including 12 first-round selections. One of only a handful of coaches to lead three different schools to 20-win seasons. At each school, Tark recorded a 20-win season in his first year. Led UNLV to the NCAA title in April 1990 (the Rebels defeated Duke 103-73 in posting the largest winning margin in NCAA championship game history). Averaged 25.3 wins per season during his 30-year major college coaching career. Led UNLV to Top 10 finishes in wire-service polls nine times (1976, 1977, 1983, 1985, 1986, 1987, 1990, 1991, 1992). Won the 2001 Don Haskins Award for WAC Coach of the Year. He won or shared Big West Conference Coach of the Year honors seven times in 10 seasons. Also was named West Coast Athletic Conference Coach of the Year in 1975. Won 20 games or more for 17 consecutive season and 29 of 31 seasons as a Division I coach. His 988 career collegiate coaching victories were the most ever counting all divisions at the time of his retirement. "Jerry Tarkanian was the backbone of Fresno State athletics for many years and today our thoughts and prayers are with his family. I'm not alone in my belief that Coach Tarkanian was more than just a game changer - he was a life changer for the young men who played. He was a mentor, a friend and sometimes a father figure. We were all blessed to have a man of his caliber at Fresno State and he will be missed."